Next Monday is Christmas Eve. After weeks of carols and crowded malls, the big day is almost here. For those of us who are cigar enthusiasts, there are a few steps we can take to help make this holiday season more enjoyable. 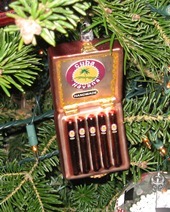 Give the gift of cigars. Chances are you have a cigar smoker on your shopping list. I’ve previously provided rules of thumb to keep in mind when buying a present for a fellow brother of the leaf, and I think they bear repeating at this opportune time. For one, remember to favor samplers over boxes, unless you know the target is loyal to one brand or one specific blend. Cigar accessories and books about cigars make more permanent gifts than those that are smokable. And buying someone a membership in Cigar Rights of America is both thoughtful and productive in the overall battle to protect cigar freedoms. Winterize your humidor. This time of year poses particular challenges to the safe storage of cigars. Taking a few preventative measures now will save you time, money, and heartache in the long run. Colder air means less humidity, so pay special attention to your hygrometer; humidors will need to be re-charged with moisture more often in the winter. Be sure to keep distilled water on hand. If you use beads, solution, or some other moisture-granting mechanism, now would be a good time to order reserves. Check the seal of your humidor to ensure the moisture you are supplying isn’t leaking out. Travel with cigars. Many will be traveling by plane to visit with friends and family over the holidays. Since they may be lost or confiscated by TSA officials, don’t pack expensive cigar paraphernalia in your carry-on luggage. In lieu of a fancy lighter, for example, bring along a Ronson (a reliable butane torch that only costs a few dollars). When it comes to cutters, opt for a simple keychain punch or a plastic guillotine. Travel humidors can be bulky, but you can achieve the same level of safety by enclosing your cigars in a simple Ziploc bag with a humi-pack, then wrapping the bag in soft items you planned to bring along anyways, such as clean boxer shorts. Share your favorites. Those cigars you’ve been setting aside for a special occasion are just begging to be smoked and shared. Friends and family who might not otherwise partake in a cigar will be more receptive to smoking on Christmas and New Year’s Eve. So if you’re traveling, bring along more cigars than you think you’ll need. And if you’re welcoming others into your home, share the bounties of your collection. Your generosity will be rewarded and much appreciated. Above all, my colleagues and I are wishing you a happy and healthy holiday season. If you have an additional tip you’d like to pass along, please provide it in the comments. Good tips overall, but I must disagree with your travel recommendation that smokers bring along a Ronson JetLite. All torch lighters are banned by the TSA in carry-on or checked luggage, except in an approved DOT-certified airtight container. It's a much better idea to simply bring along 1-2 disposable soft-flame butane lighters (I favor Djeep). And note they must be carried on; lighters have long been banned in checked baggage — even pre-9/11. As someone who flies frequently, your fellow travelers will appreciate that you don't hold up the security line. Because once they spot something that's a potential problem, they will search all your belongings even if the liighter is packed in easy reach. I travel with a Ronson all the time. They never find it. You're correct that torch style lighters are technically against the rules, but the truth is these rules are rarely enforced. I've left Ronson lighters (I generally have 4-5 at a given time) in both carry-on and checked luggage and never once had them taken. Meanwhile, I've heard horror stories about expensive non-torch lighters (also boxes of matches) being confiscated even though they seem to clearly comply with the rules. for a cheap travel humidor I use the plastic instant coffee container, holds 8-10 toro size cigars and is air tight, and rigid enough to protect the cigars. a little baking soda takes away the coffee aroma.